Styling Sisterlocks is easy because mature Sisterlocks can be styled in virtually any coif, just as hair that has been relaxed. Sisterlocks are tiny dreadlocks that are created using a special hook. Certified beauty professionals are available to install Sisterlocks. Many women choose Sisterlocks rather than traditional dreadlocks because of the size of the locks and the ease in mimicking other styles with these locks. The beauty of having Sisterlocks is that the locks are so tiny, they can be easily maneuvered into almost any style, though the length of your hair may dictate the styles that you choose for your Sisterlocks. Shorter curly hair that is styled in Sisterlocks may be curled into cultivated tiny ringlets. The curls will work within the natural texture of your hair. Wash or wet the hair. Do not dry the hair. Take small sections of hair, depending on how big you want your curls, and wrap the hair around curlers. You can use the perm rods to set your hair if you are not planning to sleep in them overnight. Wrap the hair as taunt as possible around the rod or curler. If you opt to use tiny sponge rollers, get the rollers that are covered in satin. Uncovered sponge rollers may snag and break your hair. Dry your hair. You can allow your hair to air dry or you can get under a dryer. The choice is yours depending on the time available and whether or not you desire to avoid heat in styling. When hair is fully dry, remove the curlers. Use your fingers to separate the curls. Dress up the style by wearing a headband or a glittery accessory. If you prefer not to use rods when styling Sisterlocks, because you want a style that you can sleep in overnight, you can set your wet hair in two strand twists. Remove the twists when they are dry and use your fingers to style your hair. Flat twist the first of the hair by taking a small section in the front of the hair and slowly twist the hair toward the back of the crown. Your twist should resemble a twisted cornrow. Use a tiny clip or a hair pin to hold the twisted parts in place. You can let the back of your hair hang loose or you can curl it on medium-sized rods. 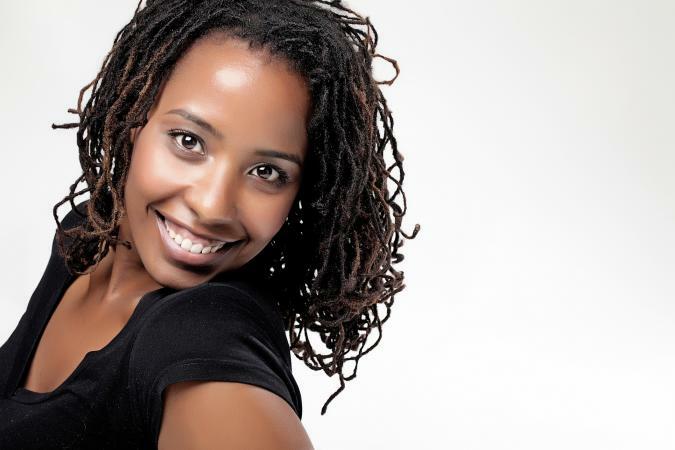 Hair that is shoulder-length or longer has a variety of styles in Sisterlocks. Pull all of the hair towards the back of the head, and roll the hair into a French twist. Use bobby pins to hold the hair into place. For long bouncy curls that resemble a relaxed style, set wet hair on large curlers. You can use plastic curlers or large flexible curlers for spiral curls. Remove the curls and use your fingers to style the hair as desired. Separate the curls to add fullness to the style. Don't be afraid to experiment when styling Sisterlocks. Look in black hair magazines to get additional ideas of styles that will work well with your length.